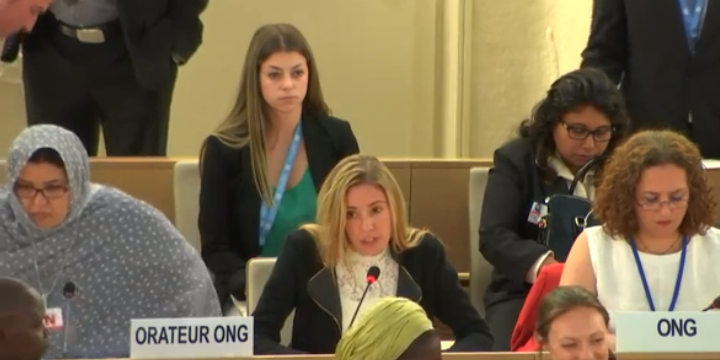 Geneva - World Jewish Congress Jewish Diplomat Aurélie Casahoursat delivered a statement on the United Nations Human Rights Council floor on September 13th on behalf of the WJC urging the Council to ensure that the victims of genocide are never forgotten and never denied. “At the outset, the World Jewish Congress wishes to thank the Human Rights Council for convening this high-level panel to commemorate the 70th anniversary of the Convention on the Prevention and Punishment of the Crime of Genocide. We also would like to take this opportunity to honor Raphael Lemkin, whose tireless efforts brought about the adoption of this landmark agreement. More than 70 years after the end of the Holocaust, we remain dismayed that humanity has not learned from its past mistakes. Despite 149 countries being part to the Convention, we still bear witness to too many instances where civilians are being targeted for who they are or what they stand for, by murderous regimes intent on their destruction. We have collectively failed to protect the most vulnerable and must redouble in our prevention efforts to ensure the perennity of this noble document. While prevention is essential to safeguarding the victims of today, remembering the victims of yesterday, as noted in the resolution which established this panel, plays a key role in the prevention of genocide by providing “an opportunity for everyone to learn lessons from the past and to create a safer future”. Unfortunately, we are witnessing a worrying increase in attempts to rewrite history by denying the crimes these victims were subject to. As an example, a recent study commissioned by the WJC ahead of the 2018 International Holocaust Remembrance Day, found that more than twice the number of conversations denying the Holocaust were recorded on social media in January 2018, as compared to the same period in 2016. The WJC Jewish Diplomatic Corps is a flagship program of the WJC, and a worldwide network of Jewish professionals acting in the fields of diplomacy and public policy on behalf of world Jewry. Members of the WJC Jewish Diplomatic Corps have delivered over 70 statements on behalf of the WJC over the past four years at the UNHRC.